Joseph Busch is a fully certified, and licensed chiropractor in Panama City Panama. 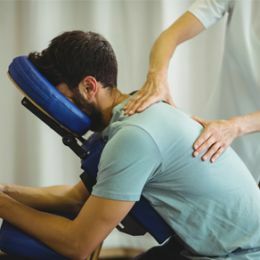 His treatments involve adjusting the vertebral column in the necessary areas which are determined only following a comprehensive physical exam and medical history. Chiropractic is a type of patient care that involves non surgical, non pharmacological methods of patient treatment. Commonly used for low back pain, and neck pain, chiropractic is also a very effective strategy for wellness, care, which is staying healthy! If you are interested in seeing a chiropractor and would like to find out more, please email us or call 507-215-0184 for personalized answers to your questions from our friendly team. We are located in Punta Paitilla, Behind the McDonalds, accross the street from the Centro Medico de Paitilla. Schedule your appointment today! "At Busch Chiropractic-Panama, we´re not happy until we know that our patients are on the road to good health and healing. We are partners in their health." is dedicated to helping you achieve your wellness objectives. Dr. Joseph Busch is a board certified, licensed Chiropractor, now in Panama City, Panama! He has a passion to help patients in finding solutions to what ails them, through natural, non invasive approaches. "I sought chiropratic help when I was experiencing some continuing lower back pain issues. I had previous chiroprator experience, with varying degrees, in the United States so, I approached Dr. Busch's office hoping for the best. I was impressed with the thoroughness of the introductory questionnaire and followup interview. They evoked a high level confidence in the competency of Dr. Busch. The crowning point came when Dr. Busch conducted a test that showed that I put more pressure on my left foot when walking than my right. I had never been given a test that so convincingly demonstrated a root cause." "El Dr. Busch es la tercera quiropráctico que he visitado en mi vida (por mi bienestar todos han sido excelentes profesionales). Ahora vivo en Panamá y sé que puedo contar con los servicios de Dr. Busch y mejorar mi salud sin la ingestión de productos químicos (pastillas). Adicionalmente el stress severo ( caso que sufri recientemente y describo) puede afectar el buen funcionamiento de los músculos y los nervios en cualquier parte de nuestro cuerpo e interferir con el sueño y el descanso diario. El Dr. Busch me sanó con sus terapias. Por último, toda la atmósfera en la oficina es muy agradable y el Dr. Busch tiene un personal altamente calificado y amable. A propósito visité a este doctor por referencia de un paciente curado y satisfecho. Gracias Dr. Busch !!!" "Muy profesional, muy buena atencion, mejoré mi dolor lumbar en 6 sesiones con el Dr. Joseph. Las asistentes todas fueron excelentes." "Alinea tu cuerpo con tu espíritu , saca lo mejor de ti con la ayuda del doctor, en cada sesión se puede sentir como retorna la energía a tu cuerpo, es lo máximo." "Excelente Dr., excelente atención, lo recomiendo!!!"